A much better day today, with just occasional showers and very little wind. The Good Shepherd sailed and brought back a variety of exciting things, including a new freezer and two fridges for the Obs (well, we were quite excited at least). In the evening we had an interesting meeting attended by a lot of the islanders discussing the proposed MPA for Fair Isle then it was off home to watch the second episode of this series of Shetland (based on the books written by former FIBO cook Ann Cleeves). I really enjoyed it, although anyone who hasn’t visited Shetland before should note that we do get sunshine as well as fog sometimes! SPOILER ALERT! It also ended on a great exchange between Magnus Bain (Brian Cox) and Jimmy Perez (Douglas Henshall): ‘Whar’s du fae?’ ‘I’m fae Fair Isle’, which seems like a great catchphrase (I might get it made up as a t-shirt). Douglas Henshall was also very complimentary of his stay on Fair Isle in an interview, although he was perhaps a little harsh on our airstrip! The cast and crew were all great to be around and it’s good to see the results on screen now – we’re looking forward to episodes five and six, which are based on Fair Isle. Shortly afterwards, we got the news that Fair Isle Primary had made the final of the competition mentioned in the last blog post (see here for news). Hopefully their efforts will be rewarded by winning the prize of a trip to London, we’ll report further when we get any more news. Anyway, on to the birds. The calm weather did indeed aid migration, with Deryk finding the day’s star bird (and the rarest find of the year so far for the island): a drake Green-winged Teal on Da Water. It accompanied the three Teal that had been present for a few days at least (so appears to have arrived alone) and is only the third record for the island following drakes on Da Water on 25th-27th April 2009 and 31st March-6th May 2012. There has to be a hint of a returning bird given its previous absence from the island’s avifauna, although the lack of records in intervening years suggest that this is maybe just an upturn in records (and the coincidence in location is easily explained by the lack of many other suitable water bodies on the island). 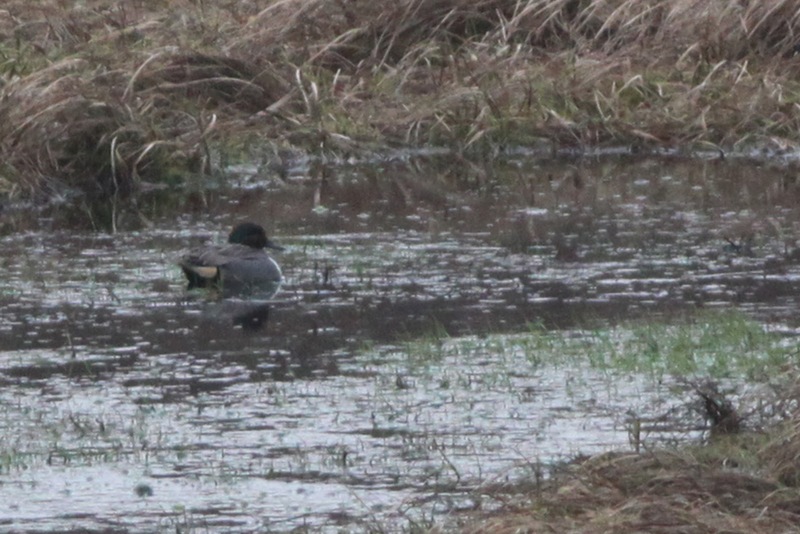 A distant record shot of the Green-winged Teal. There were two other additions to the year list; Grey Heron and Moorhen (the latter a relatively scarce spring migrant, with one running along Pig Street this afternoon), taking the total to 82 for the year (the same as the end of March last year). Generally migrants were not abundant, although Meadow Pipits increased to over 20, two Pied Wagtails appeared at the Obs and as well as the wintering flock of around 80 Greylag, over 30 others passed through. A Merlin may well have been a wintering bird, and the Kumlien’s Gull was still present. The weather is set to return to strong westerly-based wind with rain for the next few days (or weeks, if we really have used up all our south-easterlies over the winter…), so it’s likely to be quieter again for a while, but it’s starting to feel like spring has finally made it, so there will hopefully be a few more birds struggling through regardless. In that vein, why did they have that exchange twice in that episode? Magnus didn't seem to suffer from dementia or Alzheimers. Is there a specific Cultural context of that question? For example in Taiwan, one very old cultural greeting is essentially asking someone if they've eaten. Is this a similar greeting, or show of acceptance (as regards Perez's Spanish side)? I think thats a logical assessment. Perez's Spanish "side" is too far back to matter. It was just an exchange of shared respect, what Magnus asked him when they first met. Where someone is from among the islands is important to the natives of the islands. It's like that in all isolated places. 3/11/19 Im from CA, USA .. Just discovered Shetland. Great show! I had to have it on closed caption, though. Lots of words unfamiliar to US English, like "perrie lass." What language were Pérez & Magnus speaking at the end of the episode? Also, isnt Magnus a Swedish name, not a Scottish one? A Perrie lass is a tiny girl- a little girl. They were probably speaking Gaelic specific to Shetland. Asking where Jimmy was from with the reply, “I’m from Fair Isle”.